Neat and complete motor, self-sufficient. To rent our neat and complete half-integral camper. We have this camper now a year and are, just like our tenants, very satisfied. We have already made a number of trips to Germany, France and of course in the Netherlands. 1. It is a nice camper, fully equipped, such as shower and toilet and more than enough storage space. The camper runs well, also in the mountains. 2. It is in all respects a safe camper. 3. The camper is completely given to you. In principle, you only have to bring your own personal items and eat and drink. 4. The camper is self-sufficient. Power supply can, but is not always necessary, because there is always 230 volts available. 5. No hidden costs or extra costs for all kinds of options up to 1500 km per week. 6. As a landlord we offer our tenants the service that is required or desired, such as free car parking, free transfer from and to the nearest station, washing bed linen. We will explain these reasons in the following. The camper runs on diesel and can be driven with driver's license B. The powerful and at the same time economical 2800 cc engine (1 in 10 is very possible) is strong enough to drive in the mountains. The camper has a length of 6.80 meters. There is a fixed double bed (195 x 135) with a new mattress and the dinette can also be converted into a double bed (187 x 130). The dinette contains 4 seats, 2 of which (in the direction of travel) fitted with roller belts. In total there can therefore be 4 people. There is a shower and toilet on board. Of course a shower on a campsite is more spacious and comfortable, but this shower is also very good to use. We do this regularly because we do not have many campsites. The kitchen is equipped with a 3-burner gas stove and refrigerator. A combi boiler on gas provides hot water and heating. In addition, the camper has underfloor heating. The hot water in the boiler is more than enough to shower with two people in succession. Under the bed (the "garage") there is a lot of storage space and in the camper there are many cupboards. There is a waste water tank and a clean water tank. To sit outside, the camper has an awning and a table with good seats is available. And if you are forced to sit inside, you can watch TV or play a DVD. For safety a gas detector, smoke detector and fire extinguisher are present. The gas installation (LPG) has been inspected for use in Germany, according to the so-called German G607 standard. Although it is not the youngest camper (year 2000), it is technically in good condition to get on with it responsibly. 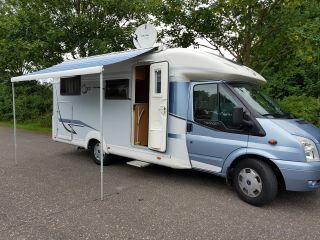 The camper gets a big turn for the rental season and a new MOT. The gas installation must be re-inspected once every two years. We ourselves also completely follow the camper and resolve possible defects or malfunctions. Due to age the camper may not enter environmental zones (German: umweltzones). This is not a problem for through highways through environmental zones. By complete we mean that everything you need is present. So only bring your own private items. The kitchen is well equipped with everything needed for 4 people. 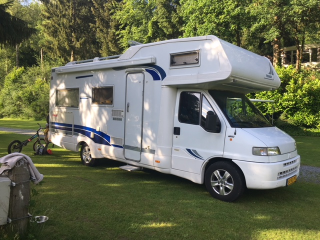 The camper is delivered ready for use with towel package (bath and kitchen), made bed, full fuel tank, at least 1 full tank of gas, filled clean water tank and sufficient toilet fluid for your trip. Self-sufficient means that in principle you can stand anywhere and are therefore not tied to an electricity connection and the presence of sanitary facilities. The most beautiful places you do not have to shoot because you do not have electricity or plumbing, because showering can be very good in the camper itself. On the roof is a solar panel and there is a 500 Watt inverter (12-230 volts) on board. A pure sinus, allowing all devices to be connected without going to pieces. Together with the two household batteries of a total of 180 ah, this makes the camper self-sufficient. The price is all-in, with the exception of the kilometers above 1500 km. Most tenants have more than 500 km per week. So no extra or hidden costs. No extra options, so the final rent is still higher again. You only pay the deposit and the fuel of your trip. Upon arrival by train we can get you from the station in Meppel for free. If you come by car, it can be parked for free in the RV park, near our house. Before you leave, you will receive a complete explanation of the motorhome so that you can travel with ease. There is also a handy manual, which you will be sent on time when you make a booking. We are always available for questions and problems during your trip. In the camper are camping guides with camper pitches in Europe. If you go to a certain area, of which we have tourist information, you can also get it. Upon return, the bed linen and towels from the last day need not be washed. We do that for you. In the spring we organize a day, where all tenants are welcome to view the camper, take a ride and make any further arrangements. For people who book afterwards, this possibility exists between two rental periods. In short, we want to do everything in our power to give you a fantastic holiday. We give the camper on the basis of good faith. We expect tenants to deal with it as if it were their own camper. We use an all-in tariff, so no hidden costs, options and the like. Also no cleaning costs, provided the camper is also brought back clean. If this is not the case, we charge € 75 for the cleaning of the outside and € 125 for the inside. The recovery tank and chemical toilet must be empty. Pets are allowed in consultation if they do not come on the bed, the couches or the chairs. Response from Albert Jan Hallo Bouke. Bedankt voor je positieve recensie. Ik ben blij dat jullie het naar je zin hebt gehad. Succes met eventuele koop en voor een nieuwe hhuurperiode weet je me te vinden. Response from Albert Jan Mooi, dat jullie het weer fijn hebben gehad. Wat mij betreft tot een volgende keer. Response from Albert Jan Beste Peter en Bianca Fijn, dat jullie zo'n fijne vakantie hebben gehad en bedankt voor deze recensie. Een volgende keer zijn jullie van harte welkom, jullie waren nette huurders. Response from Albert Jan Bedankt voor je review Sandra. Een volgende keer ben je zeker welkom. Response from Albert Jan Inmiddels hebben we de camper ingeruild. Stahoogte is nu 10 cm meer en de camper is 80 cm langer. Dus meer ruimte.